Texas once again ranks in the bottom third of states in a state-by-state study of our children's well-being, according to the 2011 National Kids Count Data Book, released August 17, 2011, by the Annie E. Casey Foundation. This year’s data book, "America's Children, America's Challenge: Promoting Opportunity for the Next Generation," examines how children and families are faring in the wake of the recession and proposes a two-generation strategy: strengthening families in order to support children now and create opportunities for the future. Every 10 years, the U.S. Census Bureau counts every man, woman, and child to track the growth of our national, state, and local populations. Between 2000 and 2010, Texas’ total population grew at twice the national rate to more than 25 million people. 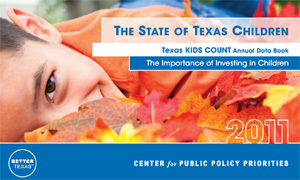 A large part of Texas’ growth is due our child population, which grew by 16 percent to 6.9 million children. This report examines the newest census data and describes how Texas’ child population changes are as varied as the state itself, differing depending on whether they live in urban or rural areas and their race/ethnicity. These changes are discussed in the context of our ongoing revenue struggle to find enough money to fund our basic needs now and plan for our future. (AUSTIN, Texas) �" A new report and analysis released today by the Center for Public Policy Priorities (CPPP) shows in the wake of a massive revenue shortfall the proposed state budget will invest $10 billion less in Texas kids over the next two years, even while more of the state's children live in poverty, have no health insurance, and are born too early and too small. The state is approximately $27 billion short of what it needs to write a budget that funds all essential services at current levels.